LiteScape CallTrackPro allows legal and professional services firms to automatically associate client-matter and project codes to inbound and outbound phone calls. 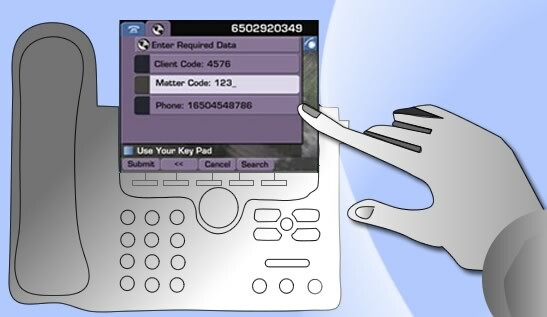 Users can easily assign calls to appropriate codes by utilizing simple menus from their phones-and with client/matter code learn features–CallTrackPro automatically associates codes to regularly dialed or received calls so you don’t have to. Precisely track, capture, and assign client calls for improved billing accuracy. Automatically associate learned numbers to client-matter codes. Integrate Seamlessly with Third-Party Accounting Applications. Integrate with accounting applications (Equitrac, @comm, ISI) and CRM applications (Elite) to ensure accurate billing and streamline business processes. Eliminate costly and inaccurate call logbook reconciliation. Emailing user, department reports to Admin or users on scheduled basis. Track and Bill time spent on the phone for a client. Integrate with Time and Billing applications.